As we have mentioned in previous blogs, for many small businesses who are trying compete against big competitors every day, technology can be a vital tool that can help them level the playing field while competing for customers dollars. With just a few pieces of technology, some apps, some accounts with social media, credit card processing and some cloud storage, a small business can be ready to take on the big boys for less than what it cost the big guys to compete. Here are just some examples of some of the solutions that are available to small business. If your business is one that works in the field or on the road, consider taking credit card or debit transactions on your smartphone or Internet-enabled device by using mobile POS (Point of Sale) solutions that will save you money on full POS systems. Big competitors have a harder time using some of these solutions because they were developed for small businesses and therefore are more expensive to scale up for use by larger organizations. One of our virtual office clients who works on the road also mentioned that for years people have said “Think outside the box.” These days he says you may want to start thinking about the box again. While QR code boxes have been around for a few years now, some businesses are just now re-discovering how useful these bar codes can be. This is especially true if you want to use a scan-to-pay system on your smartphone and keep track of both sales and inventory – even if your inventory is the time you spend on a project or performing a service. For small online retailers that also cater to physical shoppers or wholesale clients, e-commerce platforms like Shopify POS can sync information about customers and sales made both online as well as in wholesale or retail locations. Keep your client profiles and accounting information in the clouds. Quickbooks, Freshbooks, Xero and Wave accounting offer a range of prices and degrees of complexity in online accounting options. Many CRM (Customer Relationship Management or Client Relationship Management) programs like Salesforce.com, Zoho, SugarCRM, NetSuite CRM+ and others are available on a cloud platform that is easily accessed on a smartphone or a tablet computer on the go. Being able to get these important tasks done when you are out of your office can save you time when you do return to your office space. Besides cloud sales and productivity solutions, small businesses have a better opportunity to retain customers and build loyalty by engaging their customers and fans on in their social media channels. By keeping up the engagement and personalizing social contacts on a regular basis, those customers who see that extra mile taken will remain loyal and be your best promoters. Don’t just tell them why you are better or what you have on sale; keep them up to date on things that are going on in your industry or theirs. Deliver the content that your customers are seeking from you and you’ll keep them following you. While keeping your customers engaged with your social channels, you also need to reward that loyalty. One way that Telsec Business Centres does this is by regularly rewarding followers and those who continue to engage with them, by giving away things like new bicycles, Android Tablets, restaurant vouchers and even little things like gift cards from national coffee chains. 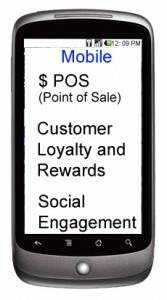 It used to be that only larger companies had access to loyalty and reward programs, but these days there are reward programs that can be integrated with a small businesses’ current POS systems. Once such platform called Vicinity is a turnkey loyalty platform from Rogers Communications. But there are also others like Belly, Front Flip and Perka that are also popular with small business owners and customers alike. Remember, these are just a small sampling of the many technologies and apps that small businesses can use to help keep them ahead of their larger competitors. We wrote a blog a few years ago that said “There’s an App for That.” In just a year and a bit, those apps and technologies can be found for almost any business model or office need.